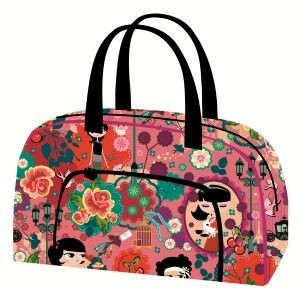 A chic design bag ideal to use as a changing bag or travel bag from the pink Romantique collection. Spacious and versatile Ideal for holidays & travelling around with baby complete with an exterior pocket for travel documents & baby bits & pieces! Spacious and versatile Ideal for holidays & travelling around with baby complete with an exterior pocket for travel documents & baby bits & pieces! This bag is a perfect size for use as 'carry on' luggage for Easy Jet ! It fits in the bag checker! Made from polypropylene so easy to wipe over. Great quality bags at LOW cost. Robust and strong - my 2 year old bag still in perfect condition even though used daily. Spillages are just wiped clean inside and out. Attractive and eye catching and very very 'oo la la' Chic!